The rows of Jizo stone statues represent the unborn children of Japan. Grieving parents place toys and other offerings beside the Jizo statue to invoke his protection of their miscarried children. While women bear both the emotional and physical strains of a miscarriage or stillbirth, men can suffer just as much emotionally from this kind of loss. Depending on a number of factors, this tragedy could be a wounding event for either parent. I’m being punished for something. It’s my fault; I did something wrong during my pregnancy. TIP: If you need help understanding the impact of these factors, please read our introductory post on the Emotional Wound Thesaurus. 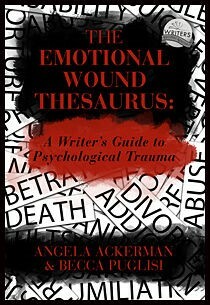 For our current list of Emotional Wound Entries, go here. For other Descriptive Thesaurus Collections, go here. I think you did well on detailing the for a writer the wounds resulting from this event. You were also sensitive to how it might stir up emotions in those of us who have gone through it (lost a child in second trimester). Those bullet points read like a checklist of all that I felt and thought, and it’s been 16 years. I was shocked to find out how many women do experience this kind of loss–yet at least at the time it happened to me, it was still a taboo of sorts to discuss it. Again, thanks for discussing it in a reflective way, as a writer might need to see it. Dee, I’m so sorry that you’ve suffered through this. I can only imagine how much quieter this issue was 16 years ago. And yet, I believe it’s still too hidden. The emotions surrounding this event are so raw and profound, I’m sure it makes it incredibly difficult for parents to talk about openly. I think this is something you have to experience in order to know how a person feels that this has happened to. I experienced this years ago when I lost my baby when I was almost 5 months along. I remember feeling very lonely after it happened. I was so used to it being the “two of us” and all of a sudden it was just me. Although my baby had not been born yet, I missed him. I would find myself out in the yard walking and talking to my baby that wasn’t there any more. It also brought me closer to my other two children. And, my body didn’t know that the child I delivered was not alive, so it was ready to nurture a new life. This added to my sadness. I know everyone is different. Some want to talk about it and others may not. Most of my family didn’t talk about it around me, like nothing had ever happened. I think they thought it would be too sad for me to talk about it. But, I wanted to talk about my baby. It helped me to talk about him, because I loved him and didn’t want to forget him. Thank you for sharing your story, Janet. I’m so sorry for your loss. I truly can’t imagine. My second child was a twin for a short time but I miscarried one of the babies very early in the pregnancy. Technically, I’m one of the 1 in 4 who have gone through this, but my experience was nothing compared to yours. Nothing. I agree 150% that no one can know what this terrible thing feels like if they haven’t been through it themselves. No amount of research will get an author to that level of understanding and empathy. But hopefully, by educating themselves and talking to people like you who are willing to share some of their stories, authors will be able to have at least a head knowledge of how a traumatic event might affect their characters. Yes, there are many wounds that I would find difficult to write because they hit too close to home or are just too sensitive. In writing these entries, I’m always wary because I know there are people reading who may have suffered through the experience. This is where, if you are writing about sensitive subject matter, deliberate and careful research HAVE to come in. In the case of miscarriage or stillbirth, there are message boards where people share their stories, facebook pages like this one (https://www.facebook.com/MothersOfUnbornAngels/?fref=photo) that offer women the chance to speak out about their experiences. Places like these offer real information about what people experiencing this tragedy have gone through. And with an estimated 1 out of 4 women experiencing this in their lifetimes, we’re literally surrounded by friends and family members who might be open to sharing their experiences with us so we can write from a realistic perspective. I agree that we need to be so incredibly careful when writing about something like this. If the story calls for it, the right kind of research is imperative. A terrible tragedy for all.